← Companies, Charities, Colleges, Radio Stations, Singer/Songwriters and Alive with Clive Global Community Members – Let’s Play! Access to over 60 of the most inspiring quotes ever written (priceless!)! 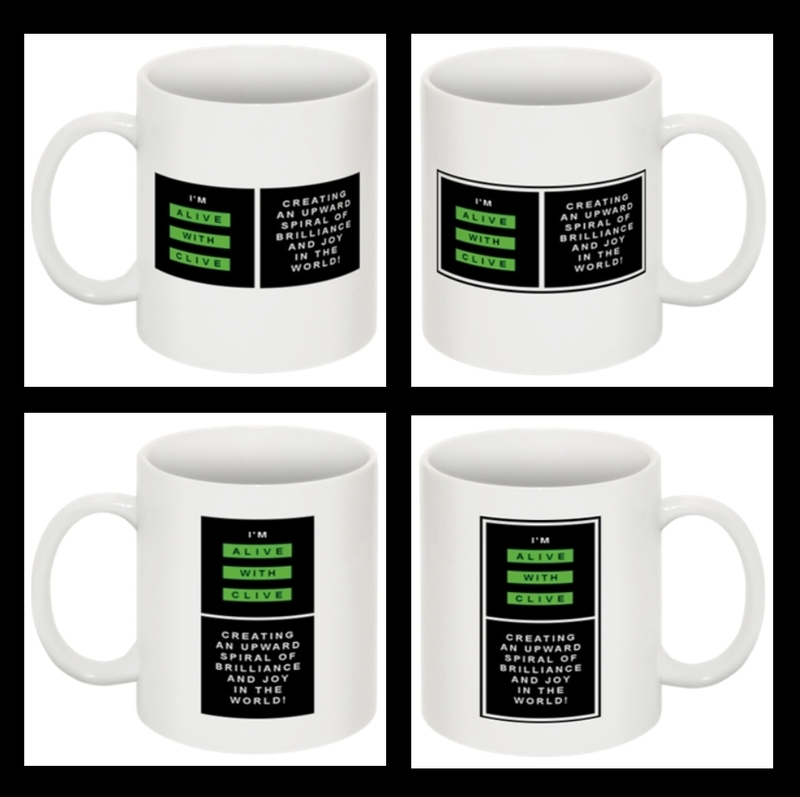 All who enter by 10 p.m. Eastern on Wednesday, July 10, whether or not you are one of the ten to win a Mug, access to the first of seven chapters from Quotes To Multiply Your Magnificence – A Compilation of the Most Inspiring and Insightful Quotes of All Time! And the quotes from me and several of the world’s most recognized leaders, thinkers and mentors are certain to inspire you to overcome even the most daunting of obstacles you face on the road to fulfilling your dreams! The ten winners of the Mugs will be determined in a drawing of the first ten names of entrants from a hat after 10 p.m. Eastern on Wednesday, July 10, and will be announced by no later than 6 p.m. Eastern on Thursday, July 11. As you’ll see from the picture above, there are four different styles of Mug, and you are likely to obtain the one you want if you are one of the ten winners. For an entry to count, you must submit correct answers to all five questions and nominate a charity, a college and a radio station – the last vital step after you have submitted your answers. Be entered in The Inaugural Alive with Clive Bimonthly Contest, which ends on July 31, 2013, to win ALL the Prizes. So join in the fun, and — who knows — on July 11 you might just be one to discover that an Alive with Clive Mug is something you have won! I look forward to seeing your entry in the contest. This entry was posted in Alive with Clive Contests and tagged Alive with Clive, Alive with Clive Gift Store, Alive with Clive Mug, Bronze Member, college, contest within a contest, discovering your passion, drawing, first ten names, five questions, four different styles, fulfilling dreams, fun, Inaugural Alive with Clive Bimonthly Contest, insightful quotes, inspiring quotes, July 4, last vital step, Meggin Ceol, multiplying magnificence, nominate a charity, overcoming daunting obstacles, priceless, quotes, Quotes To Multiply Your Magnificence, radio station, Set of 4 Alive with Clive Mugs, singer/songwriter, singer/songwriter Meggin Ceol, survey, Ten Alive with Clive Mugs, The Alive with Clive Global Community, unleashing the genius within you, world's most recognized leaders, world's most recognized mentors, world's most recognized thinkers. Bookmark the permalink.